Unable to establish connection to www.arcgis.com from ArcGIS Pro? After installing ArcGIS Pro 1.1 on two machines, I am now unable to run the program. Unable to establish a connection to www.arcgis.com. After installing the first instance of the software I tested it and it worked fine. It stopped after I installed the second instance. The "Unable to establish a connection to www.arcgis.com." error message indicates a connectivity problem between ArcGIS Pro and arcgis.com. It is quite possible that something else happened on the first machine around the same time you installed Pro on the second. I can't think of a direct connection between the second install and the connectivity failure. See if you can connect to www.arcgis.com using a web browser. If it fails in the browser, it's specific to the machine configuration and not isolated to ArcGIS Pro. 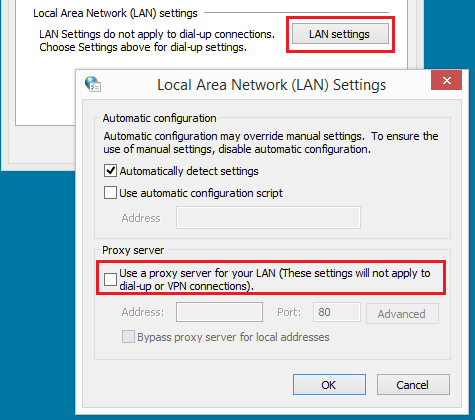 Check the value of the Proxy server checkbox: Internet Settings control panel >> Connections tab >> LAN settings >> Proxy server section "Use a proxy server for your LAN". If it's checked and you are able to uncheck it, try unchecking it an running ArcGIS Pro again. Tushar Jadhav reminded me of the troubleshooting tips. Not the answer you're looking for? Browse other questions tagged arcgis-online installation software-recommendations arcgis-pro connection or ask your own question. Avoiding arcgisscripting RuntimeError: Not signed into Portal from ArcPy with ArcGIS Pro? Configuring GRASS 7 to work alongside QGIS 2.18?